An Super Famicom version of Kirby's Star Stacker, released for the Nintendo Power download service in Japan. 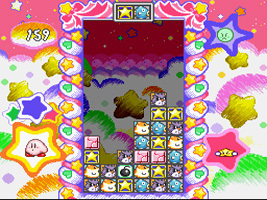 Aside from the graphical and sound enhancements, the game also features a story mode where you have to compete against characters, mostly from Kirby Super Star. The game later received a standard cartridge release, and a Western release as Kirby's Super Star Stacker was rumored, but never surfaced.